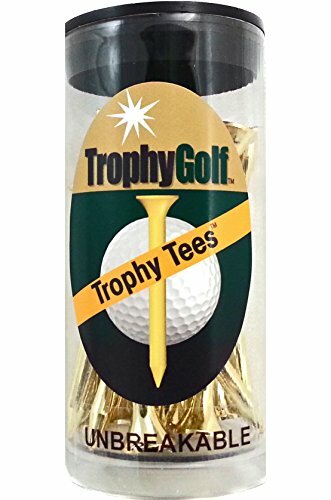 TROPHY UNBREAKABLE TEEs are a classic shaped 2.75" (70mm) long plastic golf tee available in metallic gold and silver and invisible clear. They are perfect for gifts and events and stand out in a crowd of plastic and painted tees. TROPHY UNBREAKABLE TEEs are manufactured in the USA and made from super durable recyclable plastic. TROHPY UNBREAKABLE TEEs are great for tournaments, corporate events, and gifts for any occasion. If you have any questions about this product by TROPHY GOLF, contact us by completing and submitting the form below. If you are looking for a specif part number, please include it with your message.